Ukraine said it halted natural gas imports from Russia on Wednesday after EU-brokered talks collapsed without a deal on how much Kiev should pay for its supplies and an interim accord expired at midnight. Russian gas flows to the European Union via Ukraine were unaffected. The European Commission said both sides had promised gas transit west would remain smooth, but it would not relinquish its mediation efforts until there was agreement. “From today, Ukraine is not getting gas from Russia. Transit supplies are as normal,” Maksim Belyavsky, a spokesman for Ukraine’s gas transit monopoly Ukrtransgaz, said. At the same time, Ukrainian state energy firm Naftogaz said it would not buy gas from Russia until new terms had been agreed, while Russia’s Gazprom says it will not supply Ukraine with gas until Kiev pays cash upfront. Russia had proposed keeping prices unchanged from the second quarter at $247 per 1,000 cubic metres with a discount of around $40 per 1,000 cubic metres. Kiev wants better terms. A particularly divisive issue is Gazprom’s take-or-pay clause that requires Ukraine to buy a certain amount of gas regardless of its needs. Other sticking points are the length of any agreement and the legal form it takes. Ukraine is strategically important because it is the transit route for roughly half the gas Russia pumps to the European Union, which relies on Russia for around one third of its energy. Relations between Moscow and Kiev hit rock bottom after Russia seized the Crimea region of Ukraine in March 2014 and cut off gas supplies to Kiev in June last year because of the pricing row. The Ukraine conflict has also soured ties between Brussels and Moscow, but European Commission vice president Maros Sefcovic said he still believed a solution was possible. “In the end, we are not that far apart. 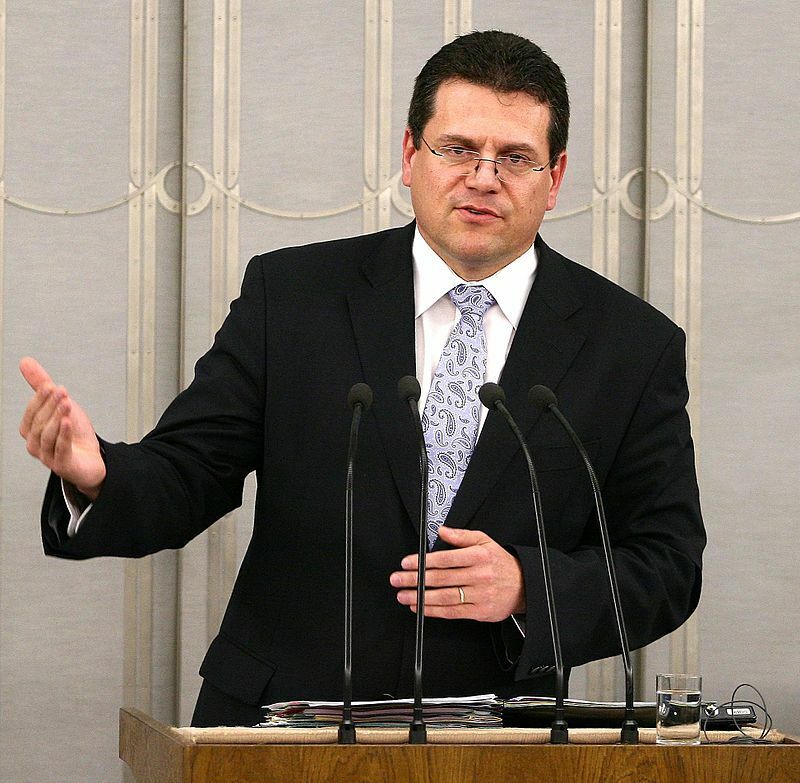 What we need is the clear political will that we want this to happen,” Sefcovic said on returning to Brussels on Wednesday after the talks held in Vienna a day earlier. Technical talks to seek a way forward will take place ahead of another round of political talks between Sefcovic and the energy ministers of Ukraine and Russia in September, the commissioner said. His goal is to get another lasting deal rather than just extend the series of interim fixes. The Commission’s mediation last year produced a so-called “winter package”. The aim is again to secure a binding deal to ensure gas flows over the peak-demand coldest months and until an international arbitration court in Stockholm rules on the pricing dispute. The ruling is expected next year, but the Commission says the timing is not yet clear. In the shorter term, Ukraine has more options than during the gas crises of previous years. Reverse-flow technology means gas can be pumped back to Ukraine from the European Union. In theory, there is sufficient capacity to provide the extra 7 billion cubic metres (bcm) of gas Ukraine needs by October to get its storage levels to the 19 bcm required for winter.